The Lane’s estate in the Adelaide Hills. South Australia wraps the country’s full array of wine making into one delicious package. Nathan Lump takes a tour and discovers some of the best eating and drinking anywhere. Most travelers to Australia—first-time ones, at least—follow a fairly prescribed itinerary, what locals refer to as the Rock (Uluru), the Reef (Great Barrier), and the Harbour (Sydney). 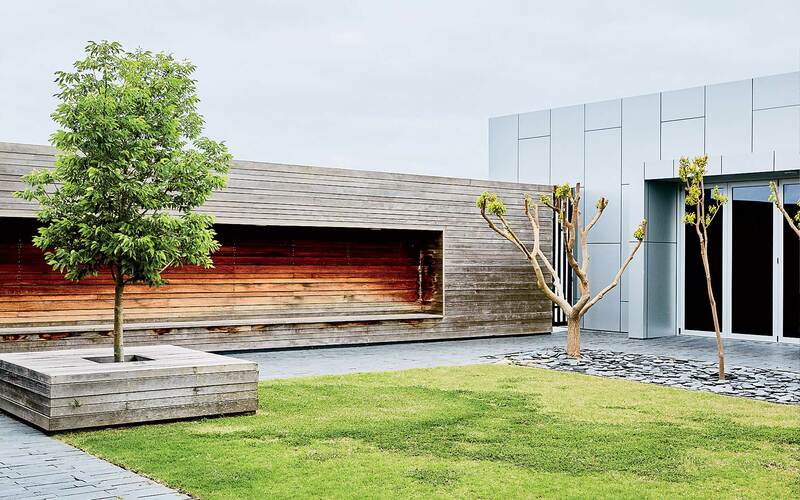 About a decade ago some started adding Kangaroo Island, off the coast of South Australia, a place of great natural wonders that got noticed thanks to a terrific luxury resort, Southern Ocean Lodge. (The lodge was ranked fourth in the world among hotels in T+L’s World’s Best Awards last year.) Still, few stop to savor much else in this beautiful corner of the continent. They should, especially if they have any interest in wine. If what you think of when you think of Australian wine is the big, high-alcohol Shirazes that dominate the export market, then South Australia is the perfect place for you to discover the full variety of Australian wine making. Within just a couple hours’ drive of Adelaide, you have four world class wine regions that are entirely distinct. What’s more, the state is also home to exceptional produce, which means the kind of talented chefs who are often drawn to wine regions the world over have great material to work with here. Drop yourself into any of these four regions and I guarantee you’ll find some of the best drinking—and eating—of your life. Just a few minutes out of Adelaide you quickly find yourself among eucalyptus groves (keep your eyes peeled for koalas) as the road wends its way up into the Adelaide Hills. 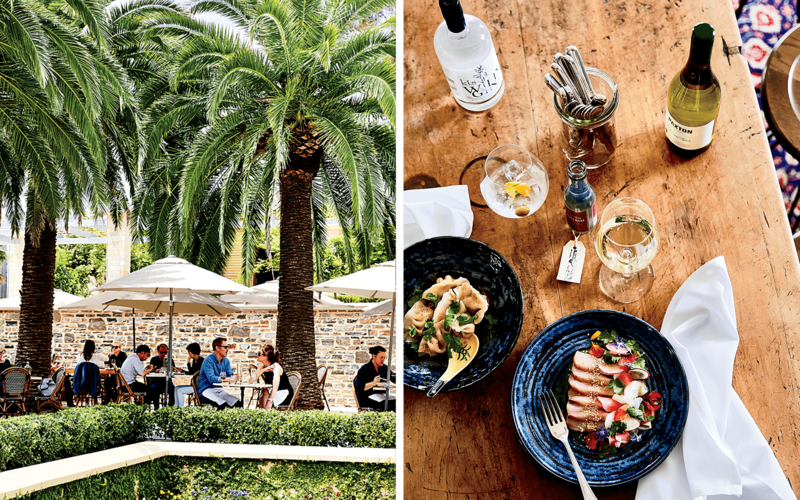 This is a true wine-producing region, but it’s also a poshly suburban place, a scenic jumble of vineyards and dairy farms punctuated with prosperous little towns that cater to city dwellers on lazy weekend excursions. You could easily spend a few days up here, but I had just one, so I made a beeline for Hahndorf, a touristy but cute town with, characteristically, a single main street lined with stone cottages built by German settlers that house shops, bakeries, and pubs. A stroll down the street will take you to stores selling everything from artisanal knives and German handicrafts to Aboriginal art. My favorite: Udder Delights, a dairy and café where you can do a tasting of house-made cheeses. Left: A local cheese plate at Udder Delights, in the Adelaide Hills town of Hahndorf. Right: Cured venison with a goat’scurd “cigar” at the Lane Vineyard. 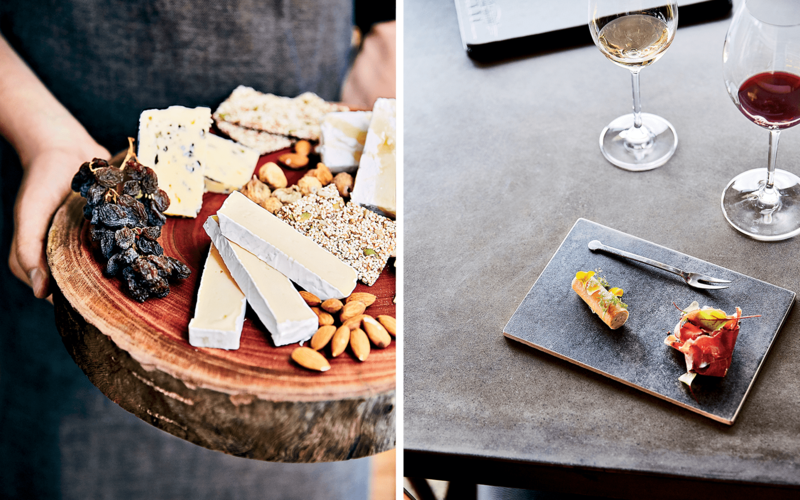 For a great meal, everyone recommends the Lane Vineyard—a winery with a sleek glass box of a restaurant that takes in sweeping views of the surrounding vineyard—and it doesn’t disappoint. The creative farm-to-table menu runs to dishes like roasted lamb dotted with salsa verde and tangy sheep’s curd beside broad beans and sweetbreads given an earthy coating of burnt herbs. The wines are a fine representation of what the Adelaide Hills region does well, including some beautifully restrained cool-climate reds. For my one proper wine tasting, I settled on Nepenthe, a large producer that demonstrates the variety of wines made in the area. I tried a Grüner Veltliner (here, typically minerally and astringent but softened with a touch of oak) as well as a crisp, intensely citrusy Sauvignon Blanc and a soft-but-spicy Pinot Noir. Nepenthe is one of more than 50 “cellar doors” in the Hills, so it was clear how much I was missing. Take the pretty Onkaparinga Scenic Drive northeast from the Adelaide Hills and you’ll follow the path of the German settlers toward the Barossa Valley, the beating heart of Australia’s wine industry. There are tidy towns of Lutheran churches, busy farmers’ markets, and bungalows festooned with roses, but mostly this is a broad, gently undulating landscape with row upon row of vines stretching to the horizon. There are upwards of 150 producers in the valley. Right across the street from the valley’s best hotel, the Louise, is Tscharke, where winemaker Damien Tscharke is doing exciting work with varietals like Savagnin, Touriga Nacional, and Montepulciano. At the Standish Wine Co., Dan Standish uses organically and dry-farmed grapes to craft only a few wines per year; his 2014 Standish Shiraz knits concentrated blueberry and stone into a wine of exceptional depth and purity. It was a standout among the hundreds of wines I tasted in a week. Testing port at Seppeltsfield, in the Barossa Valley, which keeps decades’ worth of vintages. I love discovering smaller makers like these, but you’d be remiss if you skipped Penfolds’s slick tasting room, where you can sample the full range of what this famous producer does, including the Grange, one of the country’s most cellar-worthy reds. And don’t miss the recently restored 19th-century Seppeltsfield winery for a glass of port—called Para Tawny here. 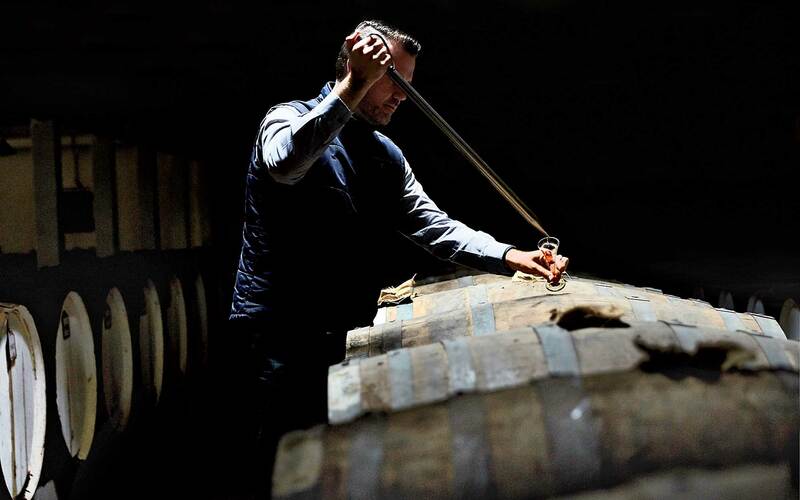 You can sample right from the barrel, including the current 100-year-old vintage and the one from your birth year. I had several great meals in the Barossa, but none topped the seven-course extravaganza at the Hentley Farm winery. Chef Lachlan Colwill creates show stopping dishes like bluefin tuna, chicken liver, and toasted sunflower seeds in a shroud of cured egg yolk—an unlikely symphony of flavor, texture, and temperature— all well paired with the winery’s vintages and served in the original stables. It was the perfect expression of what the Barossa is all about: a beautiful marriage of the rustic and the refined. Heading north out of the Barossa the landscape shifts from vineyards to vast fields of wheat and canola, sheep and dairy farms, and Victorian villages of stone buildings with lacy ironwork. When the topography grows hilly and you see vines again, you know you’ve arrived in Clare. Left: Outdoor dining at Seppeltsfield. Right: Kingfish sashimi and prawn-and-crab dumplings at the Salopian Inn, in McLaren Vale. You could describe Clare as the Sonoma to Barossa’s Napa. It’s quieter, more agricultural in feel, and the conditions—steeper, cooler— lend themselves to doing things at a smaller scale. This is Riesling country, probably the best place to taste the Australian way with the grape: bone-dry, flinty wines with notes of citrus or green apple and a strong acid backbone. Jim Barry is one of the best places to get an introduction to Clare Riesling, though it also makes some fine reds and experiments with new varietals (I tasted its first bottling of Assyrtiko, also a first for Australia). A maverick spirit permeates one of my favorite Clare wineries, Shut the Gate, where winemakers Richard Woods and Rasa Fabian are working with purchased fruit to produce some fascinating wines, like their intensely minerally Fiano and a restrained Shiraz expressing plush red fruit and smoke. They sell local cheeses and terrines in their rustic cottage, so you could pick up a few snacks, select a bottle, and while away an afternoon in the pretty garden out front. One afternoon I had a leisurely lunch at the beloved winery and restaurant Skillogalee. I sat on the terrace under the shade of an olive tree facing the vines as swallows and butterflies careened by, and after placing my order I went into the stone farmhouse. In a narrow room with a stone floor and blazing fire, the staff generously had me taste every wine on offer (a dozen! ), and I selected one to drink with my meal. The experience felt simple and sweet and deeply hospitable and—although both the food and the wine were delicious—that was the magic of the place. In all the wine regions of South Australia you’re never very far from the sea, but it’s in McLaren Vale, south of Adelaide at the base of the Fleurieu Peninsula, that wine country meets the water. You can, as I did, start your day with a drive along the wide, white expanse of Silver Sands Beach and end it at the Star of Greece restaurant, watching the tide come in while having some of the freshest, creamiest oysters you’ll ever eat. And in between you can taste some pretty great wine. As elsewhere in the state, there is a great variety in producers and experiences here. On one end of the spectrum is d’Arenberg, which makes some knockout Shirazes and is currently building an ambitious piece of modern architecture called the Cube; when completed it will house a restaurant and cellar door where visitors will be immersed in a “wine fog.” I had a lot of fun doing the blending course, in which you taste and learn about the juice that comes from different parcels and then craft your own wine. The winery at Primo Estate, in McLaren Vale. There are also avant-garde producers making wines you’ll likely never find at home, like Brash Higgins, where former New York sommelier Brad Hickey is making Zibibbo and Nero d’Avola in clay amphorae, or Primo Estate, a gorgeously modern winery where Joseph Grilli is showing what Australia can do with Sangiovese and Nebbiolo. I loved the wines at Bekkers, stylistically some of the most elegant I tasted on my trip, like the 2013 Syrah with typical black-fruit and chocolate notes but an unusually perfumed nose and fresh liveliness on the palate. I happened to be in McLaren Vale during the annual convention of the region’s winemakers. They gather under a big tent in a field, have lunch, and enter their wines in a competition judged by their peers. When I arrived the lunch was over, and the group was mingling over more wine and discussing the winner from S.C. Pannell, which took first with one of its Touriga blends. It was a true community gathering, and even though I was an interloper, I was welcomed with a hearty handshake and a glass. It felt so emblematic of this place, sophisticated but casual, serious but fun-loving. I couldn’t have enjoyed myself more. Adelaide is the gateway to South Australia, with frequent connections from other Australian cities. The Louise A low-slung compound of stucco buildings surrounded by lavender plantings. Rooms have gas fireplaces and outdoor showers, and there’s a great restaurant, Appellation. Marananga; suites from $445; four-course tasting menu $94. Thorn Park by the Vines A bed and breakfast in rural Clare Valley where owners David Hay and Michael Speers treat you like friends staying for the night. Sevenhill; doubles from $319. Vineyard McLaren Vale Four cozy cottages with kitchens and porches set on a hill with lovely views out to the vineyards. Blewitt Springs; cottages from $281. Fino at Seppeltsfield Enjoy sensitively prepared local produce and an interesting wine list. Seppeltsfield; small plates $17–$21. Hentley Farm Try the seven course Discovery Menu paired with award-winning wines. Seppeltsfield; tasting menu $139. Lane Vineyard An attractive glass-walled restaurant with excellent food. Hahndorf; prix fixe menus from $45. Salopian Inn Set in a former private house, this McLaren Vale hangout is popular for its Asian cuisine and gin bar. Entrées $21–$27. Skillogalee Stop at this Clare Valley spot for lunch in a charming setting. Sevenhill; entrées $14–$37. Star of Greece A seaside restaurant serving oysters and Mediterranean-influenced fare. Port Willunga; entrées $22–$28. St. Hugo Chef Mark McNamara’s tasting menus are designed specifically to pair with St. Hugo’s wines. Rowland Flat; tasting menus from $88. Udder Delights Have a cheese tasting before picking up the fixings for a picnic lunch. Hahndorf. Vintners Bar & Grill This Barossa hot spot does nouveau Asian dishes like coconut curry short rib with puffed beef tendon. Angaston; entrées $27–$30. Bekkers Toby Bekkers and his wife, Emmanuelle, make some of McLaren Vale’s most refined wines. Brash Higgins Brad Hickey experiments with varietals and ferments some of his wines in clay amphorae. McLaren Vale. d’Arenberg This McLaren Vale producer of killer Shirazes will add a new restaurant and cellar door in 2017. Jim Barry Riesling and Shiraz are the specialties at this winery in the Clare Valley. Kilikanoon This producer offers a structured tasting of its cool-climate reds. Penwortham. Maxwell Wines A favorite winery with a lovely terrace and grounds for enjoying a glass. McLaren Vale. Nepenthe One of the larger Adelaide Hills producers has an extensive range of bottlings and a popular cellar door. Balhannah. Paulett Wines Famous for its casual café and sweeping views, Paulett is worth visiting for the wines, too. Polish Hill River. Penfolds Although this 172-year old brand sources fruit from several regions in Australia, its main cellar door is in the Barossa Valley. Nuriootpa. Pikes Its Rieslings are beloved, but Pikes also produces some nice Savagnin, Chardonnay, Grenache, Sangiovese, and even beer. Polish Hill River. Primo Estate Winemaker Joseph Grilli draws on his Italian heritage in his fresh takes on Colombard, Sangiovese, and Nebbiolo. McLaren Vale. S.C. Pannell Named Australia’s Winemaker of the Year in 2015, Stephen Pannell is making some of McLaren Vale’s most creative blends. Seppeltsfield This historic Barossa Valley estate was recently restored and has great port-style wines. Seppeltsfield. Shut the Gate Taste their carefully crafted small-batch wines, then buy some local nibbles and relax with a bottle in the garden. Watervale. Standish Wine Co. Winemaker Dan Standish makes terroir-driven red wines of exceptional depth and finesse. Light Pass. Tscharke Savagnin, Tempranillo, and Montepulciano are among the headliners at this inventive winery. Marananga. Wirra Wirra McLaren Vale’s 123-year-old producer makes characteristic Shirazes and some biodynamic wines. Barossa Daimler Tours John Baldwin shares his extensive knowledge while squiring guests in a vintage Daimler. Barossa Taste Sensations Jonathan Milne is friendly and experienced and specializes in all four wine regions. Off Piste 4WD Tours Ben Neville knows every corner of McLaren Vale and can introduce you to nature and wildlife between your tastings.